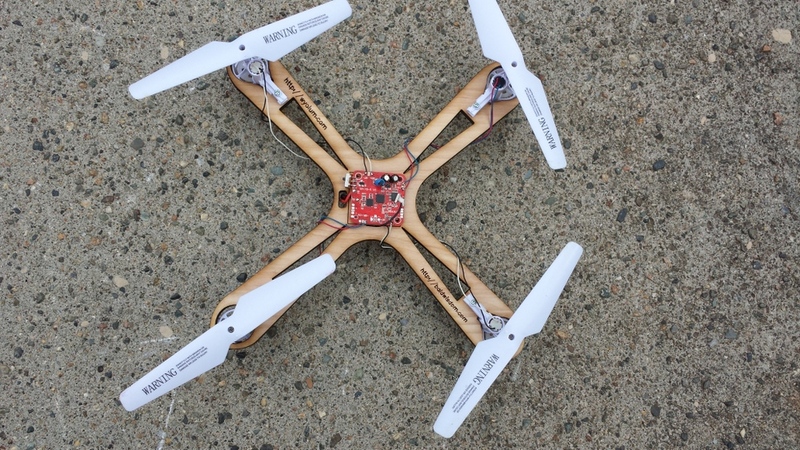 MacGuyver Copter Part 3: Success! 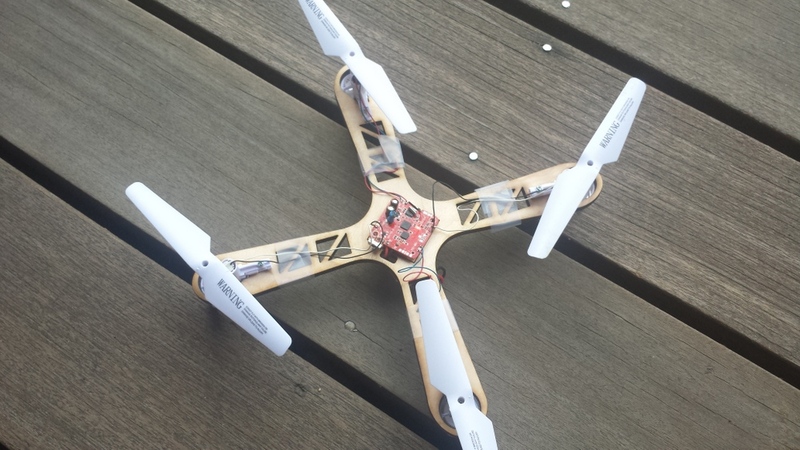 If you have been following along, in Part 1 and Part 2, I was trying to build a simple, cheap and easy quadcopter from spare parts. Well, the simplest methods failed, time to get out the laser!. 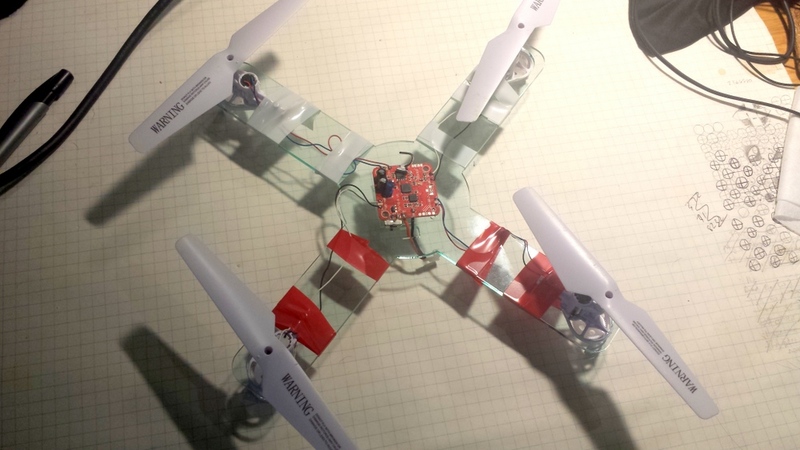 Acrylic isn’t the best material for a quadcopter frame. It’s relatively heavy, and fairly brittle. but it’s easy to cut in a laser cutter, which I happen to have, courtesy of Wyolum.com. I fixed the wiring, and then it flew! About 6 inches off the ground! I noticed that the props were rotating about 1/4 of a rotation over the body which means a lot of backwash, but the main problem is revealed when I weighed it. 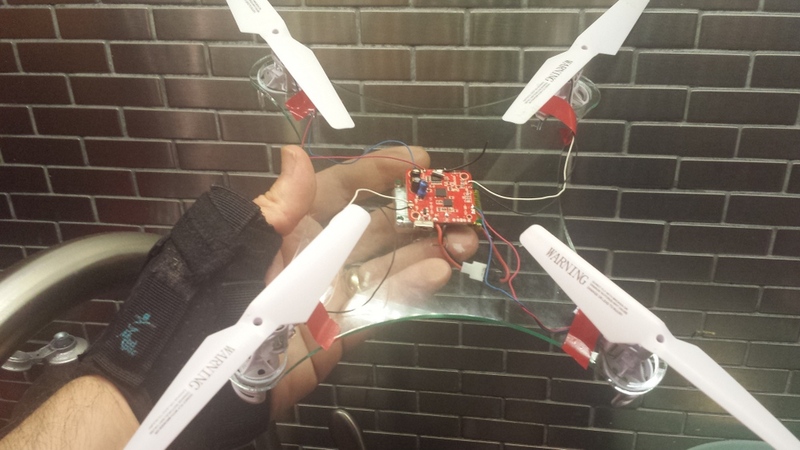 The original Syma x5C with camera and battery weighsin at 97 g.
Version L1 of the MacGuyver Copter: 122g. Flew about 6 inches above the ground. I created a new version with more or less rounded rectangle arms, and a circular central platform. I was worried because acrylic is rather brittle, and I wanted it to be strong. Version L2 of the MacGuyver copter weighed in at 106g. Flew relatively well, but inertia was killer on flips(lots of altitude loss), and battery runs down very quickly. After about 5 minutes, it was again hovering at 6 inches. Although we think of plastic as light, acrylic is fairly heavy so I tried some plywood. All I had on hand was some 1/4 inch cheapo birch plywood from home depot. I forgot to record the wieght of this one (I think it was between 100 and 110 grams), but it worked quite well. The only problems were that my cutouts came a little close to the edge, and between the cheap plywood (voids) and those thin areas, one of the arms broke in a crash. The final design simplified the cutout to be a triangle and weighs in at 84g, compared to the x5, without the camera or battery door at 88G. There are probably lighter, equally stiff materials, but this is pretty easy to do. Flys fantastic, at least to my feel It seems better than the stock version without the camera. Even though it’s less “aerodynamic, I think it handles better in a light breeze than the original, probably due to less surface area. Here’s a (pretty bad) video of it’s flight. Trust me, it’s fun! I also cut a frame out of 1/8 inch acrylic, but it was way too bendy, and wouldn’t take off. I think the props tended to thrust up, and bend it toward the middle, and the IMU (Inertial Management unit) couldn’t figure out a way to get enough power out to get it in the air.